Spin Ravenoid is a Special Attack Bakugan. It can twirl into the ground for an underground attack. Its massive wings allow it to shield its body from attackers. Its claws are unbreakable. It evolves from Ravenoid. It's Ball form resembles Alpha Percival. 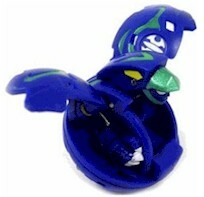 Spin Ravenoid is a spin Bakugan which the top half of it spins when it opens. It can revolve around its upper half when place in a magnetic surface. It has a 40% chance to rotate in perfect circle. Purchase your Spin Ravenoid from Amazon now!